Data Encryption Standard is a symmetric-key algorithm for the encrypting the data. It comes under block cipher algorithm which follows Feistel structure. Here is the block diagram of Data Encryption Standard. Explanation for above diagram: Each character of plain text converted into binary format. Every time we take 64 bits from that and give as input to DES algorithm, then it processed through 16 rounds and then converted to cipher text. After initial permutation, 64 bit text passed through 16 rounds. In each round it processed with 48 bit key. That means we need total 16 sub keys, one for each round. See below diagram, it will show what happening in each round of algorithm. Round i: In each round 64bit text divided into two 32bit parts. Left and Right. You can see in diagram Li-1 and Ri-1. As algorithm says, Right 32bits goes under Expansion Permutation. After expansion permutation we have to XOR the output 48bit with a 48bit sub key. Let see how that 48bit sub key generating from 64bit original key. 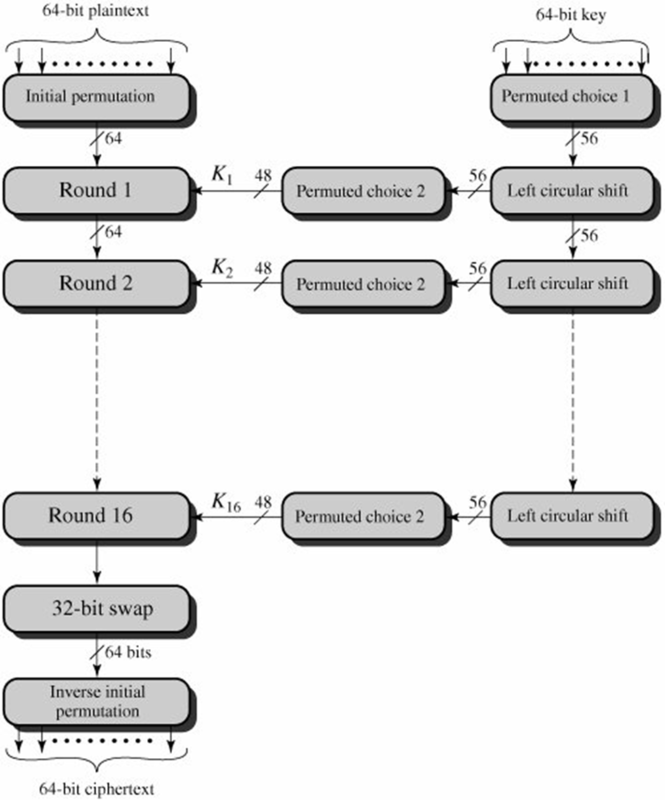 Left Circular Shift: 56bit key from permutated choice 1 given to left circular shift operation. Here that 56bit key divided into two equal halves of each 28bit. These 28bits shifted depends upon the round number. We already have the data that in each round how many bits circularly we have to shift. You can see this data in shifts array in code. Permutated Choice 2: Result of Left circular shift 56bit key given to permutated choice 2. This step will produce 48bit sub key. For this it has an 1×48 matrix, in which out of 56, some random 8 bits will be discarded. And remaining 48 will be there. According to this bit positions we have to rearrange the key. You can see this matrix in below code. Now output of permutated choice 2 will be Xor with output of expansion permutation, which results a 48bit one. This 48bit again reduced to 32bit using Substitution boxes [called S box]. Substitution boxes [S box]: In DES algorithm we have 8 S boxes. Input for S box is 48bit. And output from S box is 32 bit. The input 48 bit will be divided equally to 8 s boxes from s1, s2, … s8. So each s box will get 48/8= 6 bits as input. This Each S box reduce 6 bits to 4 bits. i.e input for each S box is 6 bits and output is 4 bits. Finally, 8*4 = 32 bit. Which is final output of S box operation. 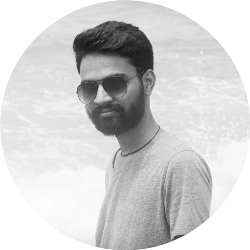 Let see how 6bits converted to 4 bits from S box. S box is an 4×16 matrix containing numbers in range 0 to 15. Take example, assume input 6 bits for S box are 011011. In this first and last bit together represents row number. Since maximum number with two bits is 3, S box also contains 0 to 3 rows total of 4. And middle 4 numbers together represent column number. Since maximum number with 4 bits is 15, S box also contains columns 0 to 15 total of 16. So here first and last bit = 01 i.e. row number 1 and middle 4 bits 1101= 13 i.e. column number 13. So for this input the number positioned at row 1 and column 13 will be picked. As mentioned earlier S box only contains number in range 0 to 15. All can be represented in 4 bits. So picked number 4 bits are output for the S box. See the code for all S boxes. Permutation: After getting output from all S boxes, we are applying again permutation. Here also a matrix with different arrangements will be there, we have to arrange according to that. Final XOR: After this permutation, take the left half which initially divided 64bit text to two halves. Do XOR with this permutation output to left 32bit part. This result is new Right part. And Right 32bit part which passed through all permutation will be come as new Left Part. These 2 parts will be the inputs for the second round. Same as keys also, the parts before left shift are next round input keys. All this explanation for a single round for a 62bit plain text. Like this, it passes through total 16 rounds. 32 bit swap: After completion of 16 rounds, final 64 bits divided into two 32 bit parts and they swap each other. Inverse Initial Permutation: Here also a matrix will be there, in which bits are just shuffled. No adding or subtracting bits. See the code for this matrix.